Dire Wolf Tank comes with light, sound and recoil action. 2 fully poseable 9.5cm tall action figures are included for complete fighting action! 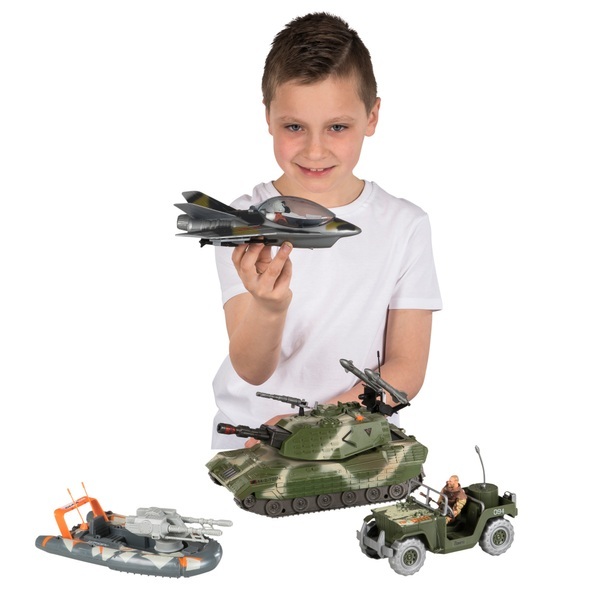 Whether it’s by land, sea or air, attack your enemies from all angles with these 4 highly detailed battle vehicles: Attack Fighter Jet, Patrol Boat, Action Recon Jeep and Dire Wolf Tank! The Dire Wolf Tank features cool light and sound effects as well as a recoil action when its pretend turret is fired. Also includes 2 poseable action figures.